"I'm not Resistance. I'm not a hero. I'm a stormtrooper....But my first battle, I made a choice. I wasn't going to kill for them." Everyone has a choice. And Finn, Finn made his choice. He chose to do what was right, he chose not to stand up for the tyrannical First Order. Now, he might not think of himself as a Rebel, but that is exactly what he is. He is choosing to fight against the stormtroopers, Kylo Ren, and Supreme Leader Snoke. When your son first saw Finn take off his stormtrooper helmet, he gasped. He actually gasped. He didn’t think that real people were under those helmets. And Finn was just so cool in his brown leather jacket. He decided right then that he would be just like Finn. He would fight, not for those who forced him to fight, but for the good guys. He would fight with Chewy, and Han. He would fight alongside Ren. But all that fighting means that he needs to look like a fighter. This Child's Deluxe Star Wars The Force Awakens Finn Costume is just the thing to make him look like the Rebel fighter he is. Your son will be the best resistance fighter the Resistance has ever seen, because he knows that the stormtroopers, and the First Order are really, really bad guys. Your son has made the choice, just like Finn did in Episode 7, to oppose the Empire. 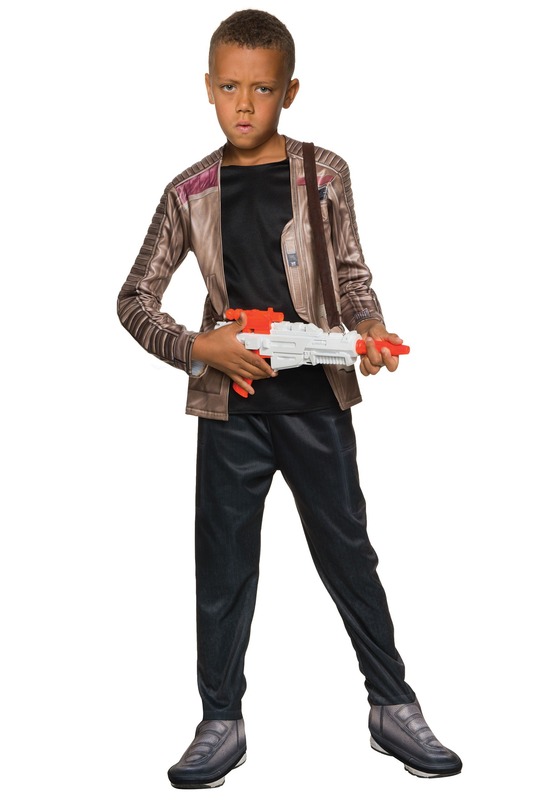 With him going against such tough bad guys, don't forget to equip him with a Finn Blaster as well. Because he won't kill for the First Order, but he will fight against them.